It's not by chance we have continued to be a successful manufacturer in Denmark, where others have not. Our success is based on constant development. And despite the fact that we use the same basic raw material as the shipbuilding industry, steel, RAIS products are undeniably high-tech and refined in every detail, and represent design excellence. This is true of our classic back-to-basics wood-burning stoves, our series of stylish wall insert stoves and our unique designer stoves. From the very first line on the drawing board, our ideas have centred around our customers' dreams and daily life in their homes. We know that this demands continually visionary and innovative sources of heat that break with tradition and demonstrate unsurpassed design. Therefore, we combine classic form with innovative, simple and sturdy features. 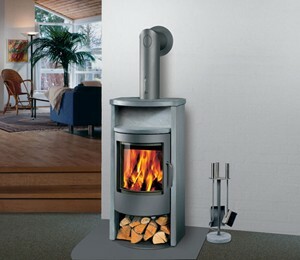 The owner of Paustian in Copenhagen wanted to exhibit the wood-burning stove; the next RAIS 1 was built for this purpose. After 3-4 years, interest in the stove began to grow. In 1974, the first series of RAIS 1 stoves were produced; at the same time, the company began advertising in the Danish interior design lifestyle magazine, Bo Bedre. And a number of smiths around the country tried to produce copies of the stove during those first years.